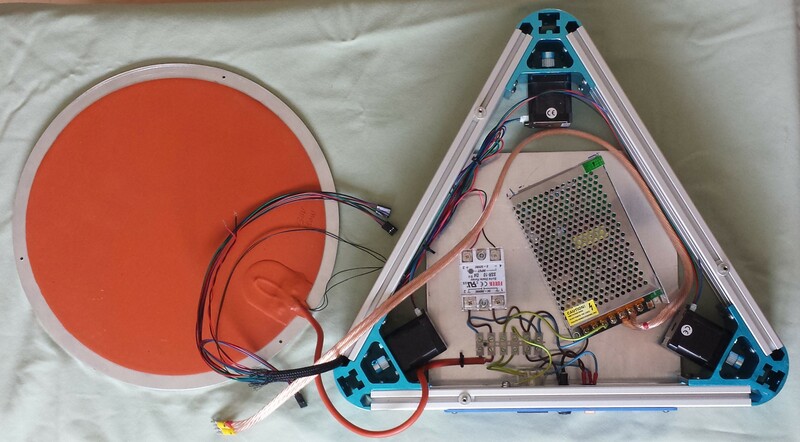 In this entry I describe how I built a largish delta printer based on the Kossel design. It started up as an upgrade to the Mini Kossel that I describe in earlier posts, but now there is very little of the Mini Kossel left in it. Two months ago I had two 3D printers: a Ormerod 1 (upgraded to dual extruder and aluminium X arm) and a Mini Kossel (upgraded to Duet electronics). Each had some advantages over the other. The Ormerod has a larger build area (200 x 210mm) and can do 2-colour printing. But if I want to print ABS with it, I will need to upgrade some of the plastic parts from PLA to ABS. My experience of printing ABS prints on the Mini Kossel tells me that I will also need to build an enclosure for it – not easy because of the large footprint it occupies, on account of the moving bed. The Mini Kossel prints faster than the Ormerod for the same print quality. It takes up less space, is more portable, seems more stable, and requires less maintenance. Its heated bed heats up very fast. I have done successful ABS prints on it by using plastic bags as a temporary enclosure. But the build area is only 170mm diameter. So I decided to upgrade my Mini Kossel to support a larger build area. My original plan was to re-use all the original Mini Kossel parts except for the bed, horizontal extrusions, diagonal rods, and power supply. I would keep the original vertical extrusions, and sacrifice some build height because of the longer diagonal rods. I successfully implemented the plan, but the reduced build height turned out to be a problem. So I decided to increase the build height, which meant changing from 1515 extrusions to 2020. The result is almost a completely new printer; so I will present the design as a new Kossel build rather than an upgrade. A printer of this height requires at least 2020 extrusions, so that is what I chose. My choice of 1m high extrusions was because this felt about right, and it reduces the price slightly because this is one of the standard lengths sold by Motedis. Using the assumption that the required bed power scales up approximately with bed area, I calculated that a 350W heater should be sufficient and give an acceptable heating time to 110C for printing ABS. At this level of power, a mains powered bed is a more practical option than a 12V or 24V heated bed. Fortunately, the fixed bed of a delta printer lends itself to mains power with fewer safety concerns than for printers with moving beds. A mains powered bed heater is easily controlled using a zero-crossing SSR. The use of mains power for the bed meant that I needed a mains inlet. Using 2020 horizontal extrusions, the standard designs for lower frame vertices provide a 20mm gap between the extrusions. This is just enough to accommodate an IEC mains inlet; but sadly, I was unable to find a combined IEC inlet and fuse holder or switch to fit in that space. I have been very happy with the Duet electronics. The firmware for it provides an excellent web interface and probably the best delta support of any electronics, featuring segmentation-free delta movement and single-iteration 3, 4, 6 or 7-factor auto calibration. However, the board supports only one extruder, so you need to buy the piggyback Duet Shield or the Due X4 expansion board if you want more. Since I upgraded my Mini Kossel to Duet electronics, the electronics has not been under the bed. I prefer it to be more accessible anyway. With mains power already going into the printer to power the bed heater, it seemed natural to fit the 12V power supply under the bed instead of the electronics. This avoids the need for an external power supply enclosure, and keeps all the mains wiring out of the way of prying fingers. 2 off 2060 x 355mm aluminium extrusion. Alternatively, another 4 off 2020 x 355mm (see note). E3D V6, 1.75mm Bowden version, 12V or 24V according to your power supply (see later). Duet 0.6 electronics board (Think3DPrint3D, RepRap Ltd); or Duet 0.85 or Duet WiFi electronics board (Think3DPrint3D, Filastruder – see later blog entries). 12V or 24V 100W (or 120W for dual extrusion) LED power supply (eBay). Either 12V or 24V is OK with 1.8 degree/step motors, but for 0.9 degree/step motors you should use 24V. 40mm x 10mm hot end fan, 12V or 24V to suit your power supply (update: if you put the electronics under the bed then you will need another similar fan for cooling the electronics). I chose the RobotDigg aluminum corners because in earlier builds, I never managed to get the towers truly perpendicular to the bed using printed corners. But if you are on a budget and have access to a 3D printer already, you could print standard 2020 Kossel corner pieces. There are also sheet metal corners under development, see the delta printer Google group for details. Motedis sell two types of 20mm extrusion, the I-type and the B-type. I used the I-type, however it wouldn’t fit into the vertical holes in the Robotdigg metal corners without enlarging the slots with a Dremel, and I needed to tap the end hole M5 myself. So B-type verticals would probably be better, as long as the slots are not too wide for the wheels. Motedis only sells 2060 extrusion in I-type, therefore either the horizontal extrusions must be I-type, or you could use 6 x 2020 B-type extrusions for the lower horizontals instead of 2 x 2020 and 2 x 2060. Also note that the B- and I-type extrusions take different sorts of T-nuts. The B-type takes M4 T-nuts that rotate into place. The I-type take M3 or M4 T-nuts that can be pushed into the slot and have a spring-loaded ball to hold them in place. Update: Robotdigg now sells a version of the aluminium corners for 2040 vertical extrusions. This would be my choice if I was starting now, to provide greater rigidity. You could use V-slot extrusion if you prefer – just check that your wheels are compatible. The 350W bed heater is adequate, but it takes 5 minutes or so to reach ABS printing temperatures. You could go for slightly more power, perhaps 400W. Instead of the cork insulator, you could use 3-skin corrugated cardboard. I used the original 17HS19-1684S stepper motors that were supplied with my Mini Kossel kit. These are somewhat more powerful than the Mini Kossel needs. I have since upgraded to 0.9 degree/step motors for the towers, to get better vertical resolution and more accurate printing at layer heights below 0.2mm, and I replaced the extruder motor by a shorter, less powerful one. See my next blog entry for alternative motor suggestions. The step that takes the most elapsed time is assembling the diagonal rods. They need to be exactly the same length, so you need to print a jig. The jig can only be used for one rod at a time, and the epoxy resin takes several hours to set. So print the jig ends first, attach them to a piece of extrusion so that the peg centres are 350mm apart, and start assembling the diagonal rods. Then print the mains inlet plate, then the feet, then the carriage parts and endstop switch mounts. While the parts are printing, you can start the main assembly. Update: it is important that you don’t have too much play in the joints. So I recommend you buy 2 packs of 12 Traxxas joints, assemble them using the hot/cold method (see later), and then pick the 12 tightest to use with the rods. You will need a different jig to make up the rods using pre-assembled Traxxas joints. Start by fitting the stepper motors in the metal corners – it is easiest to do this before any extrusions are attached, because the metal corners lack the screw access tunnels that the printed versions normally provide. Then assemble the lower triangle. Use the 2060 extrusions for two sides, and two of the 2020 extrusions for the remaining one. Note that one of the stepper motors is turned over the opposite way from the others (see photo later), to better keep the stepper motor connections away from the mains wiring. Now make the tray to hold the PSU, SSR and the terminal block for the mains wiring. Place the aluminium sheet on the triangular frame so that one edge is flush with the outer edge of an extrusion, and mark where the corners on the opposite side need to be cut off to avoid overhanging the frame. Also mark suitable positions for fixing holes to secure the tray to the frame, and for the power supply, SSR, terminal block, and cable tie holes for the heated bed cable. See the photo later for how I positioned them on the tray. Cut the corners off and drill the holes. If you will be using countersunk screws, then countersink the holes from the underside. Alternatively, you can use button head screws (the feet provide about 5mm clearance under the tray). If you wish to put the electronics under the bed, you will need mounting holes for the electronics support bracket to – see my later blog entry. Attach the power supply, SSR and terminal block to the tray, and wire them together, leaving flying leads terminating in spade receptacles for connecting to the mains inlet, and flying leads connected to eyelets for grounding the frame. Attach the tray to the frame. The long edge of the tray goes below the two 2020 extrusions – this is where the mains inlet will be. Fit the IEC mains inlet, switch and fuse holder to the printed inlet panel, and wire them together. Fit the panel to the 2020 horizontal extrusions. Connect the mains wires from the tray to the mains inlet panel. Put the fuse in the fuse holder. With 230V mains, a 3.15A slow-blow fuse is about right. For a 110V mains you would need a 6.3A slow-blow fuse. It is important that you make a protective ground connection to any metal parts that might possibly become live and be touched by the user. This includes the tray, the horizontal extrusions, the bed, and the stepper motor casings. The tray is grounded through the PSU so it doesn’t need a separate protective ground connection – but check with a multimeter that there is a low resistance between the ground input terminal and the tray. To make certain, you could add a separate ground connection to the tray. The heated bed is attached to the horizontal extrusions via metal pillars, so again no separate ground for it is required – but if you decide to fit plastic bed supports instead, for example to use force-sensitive resistors for Z probing, then you must add a ground wire to the bed. The two 2060 and the lower 2020 extrusion are grounded through being bolted to the tray. That leaves the upper 2020 extrusion. In theory, this is grounded to the 2060 connections via the bed, but I suggest you ground it separately, to ensure that it is grounded even with the bed removed. If you used 2020 extrusions for all 3 sides instead of using 2060 for 2 sides, then add a ground wire to each top extrusion. Cover one side of the cork insulator with aluminium foil or aluminum tape. This will be the top side, to reflect heat back up to the bed heater. Drill three holes about 7mm from the edge of the bed plate at 120 degree intervals, and countersink them from the top. Also make three corresponding holes or cutouts in the cork insulator, large enough for the standoffs. Attach the three standoff pillars loosely to the tops of the top extrusions, then slide them into suitable positions to support the bed plate and tighten them. Do not over-tighten – standoff pillars are typically made of brass and the threads are easily stripped. If you will be using my infrared height sensor, then the top surface of the heated bed plate is best painted black. I used matt black spray-on stove & barbecue paint. The paint needs to be cured after application according to the instructions. One option is to cure it in a domestic oven. I had already attached the heater before I painted the top surface, so I stood the heater and plate on several layers of insulation and used the heater to heat the plate to 170C for 3 hours. Plan where you want the heater power cable to be in relation to the fixing holes. Then attach the heater to the back of the bed plate. Make a cutout in the foil-covered cork insulator to clear the cable. Connect the heated bed power cable to the terminal block. To secure the heated bed cable and relieve stress where the wires go into the terminal block, thread a cable tie through the two extra holes you drilled and around the cable. Attach the SSR control wires, colour coding them so that you know which is positive and which is negative. Also attach the stepper motor cables and route them well away from the mains wiring. Bring all the wires out next to the Z tower, as shown in the photo. Now you can put the foil-covered cork insulator in place (foil side up), then put the heated bed plate on top and secure it to the standoff pillars. If necessary, tap one end of each vertical extrusion to take an M5 screw for the foot. Attach the vertical extrusions to the base so that they are flush with underside of the corners. Use an M5 screw to attach a foot to the bottom of each extrusion. Assemble the carriages and slide them on to the vertical extrusions. Attach the printed endstop switch mounts to the extrusions, and the microswitches to the mounts. Fix the endstop switch mounts accurately at the same height. Try to get them all to within 0.5mm or better. If the vertical extrusions are accurately cut to the same length, you can do this by setting the top of each mount to be 25mm below the top of the extrusion. Check that the carriages trigger the microswitches before coming to a hard stop. Fit the belts, leaving as little slack as possible. Then tension each belt by pushing the top corner up so that it no longer sits on the microswitch mount, and tighten the screw that secures the corner piece to the vertical extrusion. If you are using the Robotdigg metal carriages, use the belt tensioning screws on the carriages instead. Assemble the effector plate and hot end, and attach the diagonal rods as described in the standard Kossel assembly instructions. These are described in my articles on converting the Mini Kossel to Duet electronics. Setting up the config.g and bed.g files is described here. The RobotDigg stepper motor looms did not have the same pin connections as my other motor looms. I had to swap the outer two pins on the 4-pin header connector that plugs into the Duet. Otherwise, the motors vibrate very loudly but do not move. I subsequently discovered that different stepper motor manufacturers use different pin connections on the 6-pin JST connectors, so the RobotDigg cables were evidently made for motors from a different manufacturer. The standard PanelDue cable is 800mm, however you need a longer cable (approx. 1.5m, or 1.8m if you mount the electronics under the bed) if you mount the PanelDue under the top front horizontal extrusion as I did. I routed all 3 endstop switch cables and the PanelDue cable down the Z tower. I used the printed cable tidy pieces (the yellow printed part in the photo) to secure the cables out of the way of the carriage wheels. When setting up the bed.g file for auto calibration, ensure that at all the probe points, the sensitive area of the IR sensor board is over the bed and not very close to the edge. To get accurate readings from the IR sensor, it is essential that the effector remains level as it translates. This is not easy to achieve. The diagonal rods in each parallel pair need to be as close as possible to being exactly the same length, and the spacing between them needs to be exactly the same at the carriage end as at the effector end. Some time in the future, I may increase the spacing between the parallel rods from its current value of 48mm to around 65mm. This will increase rigidity, and should also reduce tilting of the effector if the spacing is not quite the same at both ends. I purchased a TP-LINK TL-WR702N nano router (£20 from Amazon UK) and connected it to the Duet electronics using the short Ethernet cable supplied, so that the printer is on my WiFi home network and I can control the printer from my smartphone. Alternatively, either connect the Duet direct to your router, or use Duet WiFi electronics as I describe in a later blog entry. The thermistor embedded in the silicone heater is not in good contact with the bed. Also there is a significant temperature drop across the glass. The result is that I have to set the bed temperature to 140C indicated on the PanelDue or the web interface when printing ABS. This gives 110-120C on the edge of the aluminium bed plate, as measured with a thermocouple. I use 70C indicated bed temperature when printing PLA directly on the glass. I used the extruder drive that came with the Mini Kossel kit, which is the RepRap Mini Geared Extruder. The 17HS19-1684S stepper motor is somewhat more powerful than it needs, so I have the extruder stepper motor current set at just 500mA. This is so that if the nozzle gets obstructed by the print, the motor skips steps, and extrusion resumes when the obstruction is removed. At higher currents, the extruder drive chews a crescent into the filament instead and traction is lost. Subsequently, I changed to a shorter motor and a different extruder design – see my later blog entry. Finally, here is a video of the completed printer performing auto calibration. Very interesting! How much bending do you have on the columns? Because i am using 1m of 20×40 vslot and my structure is still too flexible. If i push with a finger i can achieve a translation of almost 1cm on the top triangle, and when looking down from the top of the columns i see that the foot of the 1m extrusion doesn’t move while the top does. Using reasonable force, I can translate or twist the top triangle about 3mm from its resting position. I think the metal corners may be making quite a big difference, also using 2060 profile on 2 sides of the base triangle may be improving rigidity. I chose the Motedis I-profile extrusion because it looked beefier than the B-profile, but I don’t know if it is really, and as I mentioned in the blog, it doesn’t fit the metal corners without some work. I haven’t tried printing any really tall objects yet, so I don’t know for sure that the frame is rigid enough. Great info here and well timed too! Like you i have started to be limited by the bed size of the mini Kossel. Printing larger parts for my quadcopters and Piclop 3D scanner projects are having to be outsourced to friends but that means i lose control of quality and speed of prototyping. This all means a bigger Kossel is needed. I’ve been messing with ‘designs’ for a three hotend effector being as a delta lends itself to multiples of three and to satisfy my symmetry OCD! I’ve been looking at a 330 bed as its the largest heating element i can find (12V capton version on AliExpress, this is now in question now you bring up mains power) and was thinking of using 2040 for the uprights. The 2040 was to aid in rigidity of the frame and also provide a wider carriage to mount the wider spaced (70mm) parallel rods that would be required by the larger effector. Your findings with the metal corners though are interesting if they alone add that much more rigidity, maybe i shouldn’t worry about designing myself 2040 corners (all the predesigned 2040 corners I have found have the wrong orientation for the 2040) and just stick to the available metal ones. I suppose i should ask if your fork of the firmware will support three extruders? I know the hardware does with the x4 add on but I’ve only noticed settings for two extruders in confi.g and the web app. Keep it up, your work has been my (and many others I’m sure) go-to source of info Duet and Kossel related. The firmware supports up to 5 extruders. The web interface will show as many extruders as there are on the machine. The PanelDue control panel currently only supports 2 extruders, but I can add support for more when someone needs it. First of all thanks for putting this all together! Your design looks pretty amazing, and pretty much what I was looking for (A delta based on the Kossel mini design with timing belts and bit bigger build volume). I’d like to try your suggestion regarding 0.9 deg steppers and found the following two:17HM19-1684S and 17HM19-2004S. What I can assess is that the first one is basically the 0.9deg version of the 17HS19-1684S and the 2nd one is a bit more torqy. Given your experience with this stuff, would you think these would make sense? Does your fork of the Duet firmware work with 0.9 deg steppers / is it simple matter of changing the .h and recompiling? Either of those motors should work. The 2004S probably costs more and is overkill. You won’t be able to run the drivers at more than about 1.5A anyway without a fan, nor will you need to. My 1.8 degree 1984s run quite happily at 1A, or even 800mA if I am not trying to achieve high acceleration in travel moves. To adapt the Duet for 0.9 degree motors, all you need to do is edit the config.g file on the SD card to double the steps/mm. You don’t need to rebuild the firmware. You can stick with a 1.8 degree motor for the extruder, and even go for a shorter cheaper motor with lower torque. I was considering buying a JK42HS34-1334 for the extruder. You may have to accept a lower maximum travel speed using 0.9 degree motors, because of the rate at which step pulses will need to be generated is doubled; however I am sure you will get at least 200mm/sec. Cool! I’lve ordered 3x the 0.9deg and 2x the 1.8deg from http://www.omc-stepperonline.com/ (they are cheap, lets hope for a penny wise, pound wise here). Just to double check, you power this whole setup with a 120w LED power supply? I.e. no fancy Switching CNC 12V 350w power supply E.g. http://www.omc-stepperonline.com/switching-power-supply-400w-12v-33a-for-3d-printer-kits-115v230v-s40012-p-179.html necessary? I currently use a 12V 100W LED power supply, but for dual extrusion I will probably need to upgrade to 120W depending on the hot end heater power. I notice that the Duet board has no heat sinks or cooling fan for the stepper drivers….? This type of stepper driver chip is designed to be cooled via the PCB. The PCB acts as the heatsink. It’s 4-layer and much larger than the usual stepstick-type driver PCBs, so the cooling is more effective. I’ve never needed to use a fan to cool a Duet, but you might need to if you mount the Duet in an enclosed space with no natural convective air circulation, or you run the stepper motors at higher currents than I do. Hm i dont really get how you run a 400W heated bed on a 100w PSU. could you explain? and one more thing: are you using those wheels? No, I am using these http://www.think3dprint3d.com/V-roller. Search the web for “delrin v-roller” and you will find suppliers in other countries. As I attempted to explain under “Design considerations”, I chose an AC mains voltage heated bed, so that the 12V power supply (changed to 24V when I upgraded the printer) doesn’t have to provide power for it. I have not been able to find details of the non plastic parts needed to build one from scratch. The area of greatest frustration is the filament drive. The hole is rather small compared to the readily discovered gears which tend to run around 11 or 12 mm in diameter. What are you using for the drive gear? Hi KK, for the filament drive I originally used the RepRap Mini Geared Extruder that came with my Mini Kossel kit. After it broke and I found that it could not be taken apart (because it needs to be glued during assembly), I decided to use a modified Ormerod extruder drive instead. Both designs use printed gears. You can find assembly instructions for the Ormerod extruder at https://reprappro.com/documentation/ormerod-2/extruder-drive-assembly/ and the STLs for the printed parts of the original design at https://github.com/reprappro/Ormerod/tree/master/STLs. You can buy the whole kit of parts at https://reprappro.com/shop/parts-kits/ormerod-extruder-drive-kit-2/, or just the hobbed insert and other metal parts from RepRapPro. You also need the brass Bowden start from them. However, the Ormerod extruder variant I am using uses these printed body parts http://www.thingiverse.com/thing:318458 and these gears http://www.thingiverse.com/thing:441072. I use this part http://www.thingiverse.com/thing:963357 to mount the extruder drive assembly on the frame. You also need the printed locking tongue. There are many other extruder designs you could try, including Wade’s geared extruder, and the B’struder at http://www.thingiverse.com/thing:711401 (for that one, I strongly suggest you use a 5:1 geared stepper motor). The movement from the home position to the edge of the bed opposite the tower is approximately 680mm. Why don’t to buy 3030 and 2060 i-type extrusion from motedis… it’s not so more expensive than 2020 but much more strong on 1m structure. The metal corners are an important part of the design. With printed plastic corners is is hard to get a rigid and accurate build. Robotdigg now sells corners for 2040 verticals as well as for 2020, but not for 3030. Thanks, I already knew about the 2040 corners. There are also some sheet metal corners being developed that should cost less than the Robotdigg ones. I hope to publish another update soon covering the use of Igus joints instead of Traxxas. I have a question regarding the aluminium plate for the bed. I will be using your probe so I know about the requirement for the bed to be non reflective. I have a possibility to have the bed made from black anodised aluminium. It does not look shiny to me, it is matt. Do you think it would work with your probe? I’m going to be a pain but I have another question. Do the power supply and mains powered heated bed go through the fuse? I’m still waiting for the heater so cannot measure the current myself but is 3 Amps enough for both of them? On a slightly different note, I got a modular PS that provides 5V stand-by power. Is there a way to use that so that the Duet and web interface is visible on the network but the rest of the board is turned off so to speak? As far as I know E3D V6 head requires a fan to be running all the times. I though I could turn it off by putting the printer in stand-by. Also what do you think about using a thermal fuse to prevent the bed heater going full blast should the thermistor or something else fail. Sorry for asking so many questions. I am building a delta similar to yours and would hate to damage something due to lack of information. Yes, the mains to everything goes through the fuse. The E3D and most other hot ends require the hot end fan to be running whenever the nozzle is hot. So you can turn it off when the nozzle temperature is below about 45C. My latest firmware (currently in alpha) for the Duet 0.8.5 allows you to use the second fan output to control the hot end fan in this way. You can feed 5V standby power to the Duet via the 3-pin 5V in connector just below the main power input terminal block. You can use the PS_ON pin in that connector to have the Duet turn off the main power when a print is finished. Don’t forget to use a G4 command to delay long enough for the hot end to cool before doing this. The Duet 0.6 needs a pulldown resistor added to the board to make this work properly. Regarding a thermal fuse for the bed heater, if you choose your bed power so that the bed temperature tops out at around 170C, and you make sure that the insulation and bed supports can take this temperature, then IMO you don’t need additional protection. But add a thermal fuse if you like. The ones made for microwave ovens are cheap and readily available. Can you please give me information (name/model) of your power supply? The wiring looks weird to me and I can’t decipher it without knowing the layout of the terminals on your power supply. Thanks. It’s a generic Chinese LED/CCTY power supply like the ones listed here http://www.ebay.co.uk/itm/UK-Stock-DC-12-24V-Universal-Regulated-Switching-Power-Supply-for-LED-Strip-CCTV/151123354933. Thanks for a very useful set of delta blueprints,which I am using as my bible. While ordering the metal corners recommended from Robotdigg I fancied their metal effector, since after my experience with upgrading my Ormerod 2, the more critical parts that are metal and not printed the better. Now I come to utilise this effector only to find the holes do not align with the T3P3 hot end mount nor with the T3P3 breakout pcb. Have you or anyone else had this incompatibility issue and produced some adjusted printed parts or is drilling the effector the only other answer? The E3DV6 + IR sensor hot end mount that I published on Thingyverse has mounting options for both the T3P3 and Robotdigg effectors. You select which one you want in the OpenScad model. Briliant, just what I hoped for. when you mention the carbon fibre rods are 315mm.Is this the length of the actual rod before the track rod ends are added or the hole center to hole center length after the rod ends are added?. I’m planning a build based on yours but with mgn12 linear rails instead of v wheels. presumably Id need to adjust rod length to compensate for this change. That’s just the carbon fibre rods. The bearing to bearing distance is 350mm. Are you talking about a different measurement or is that 35mm a mistype?. I’m referring to the total length of the assembled carbon fibre rods, which I assume is 315mm + 2 x the distance from the center of the hole in the traxxas joint to its end. Just working out how far apart to space the pins on the assembly jig. Sorry, a mistype, I’ve just corrected it. Would you mind sharing your config.g file for the large kossel or the M665 settings? There is now a sys-dc42Kossel subfolder in the SD-image folder of my RepRapFirmware github repo, see https://github.com/dc42/RepRapFirmware/tree/dev/SD-image. I still dont understand about the heatbed with silicone, solid relay etc, do you have schematic picture about wiring the heatbed to ramps? 3. Other side of that switch pole – L terminal of mains terminal block. From the terminal block, one wire goes to L on the power supply, the other goes to one of the output terminals of the SSR. 4. Brown wire from the bed heater goes to a terminal on the terminal block, and a wire goes from there to the other output terminal of the SSR. 5. Other side of that switch pole – N terminal of mains terminal block. From the terminal block, a wire goes to the N terminal of the power supply, and to another position of the terminal block where the blue wire of the bed heater is connected. 7. Terminal block – E on power supply, and -ve output on power supply. Would it be better to have the motors in the upper section? It would make the printer taller, because the lower section would still need to be deep enough to accommodate the power supply, SSR and mains wiring. Ideally a second set of the 60mm high metal corners would be used at the top. One issue that would need to be thought about is how to insulate the top section from heat when a heated chamber is used. Why are you using a diagonal push rod length of 350 mm, with a 355 mm horizontal extrusion length of 355 mm – such that the push rod length : horizontal length ratio is 0.985? I have heard that a ratio of 0.8 is preferable. This is because, apparently, any higher results in reduced vertical carriage movement, and possibly, a lower resolution. Any lower, and the vertical carriage movement is excessive and results in slower prints. The ratio of 0.8 is what Johann came up with in his original design. Unfortunately, I don’t have any links to back this up with theory. Therefore for a horizontal extrusion length of 355 mm, the ideal diagonal push rod length would be 355 x 0.8 = 284 mm. Is is possible to disregard what I have heard about the ratio, or would using it actually result in better prints? I have checked a number of designs and very many, if not most, use a ratio, or end up having a ratio, of 0.9 and above. So, maybe what I have understood about the ideal ratio of 0.8, could be wrong. The notion that there is a single ratio of diagonal rod to horizontal extrusion length that is right for all delta printers is misguided. It depends on the geometry of the corners that join the horizontals to the towers, the size of the effector, and the carriage design. What matters is that the rods are at no less than 20 degrees (preferably 25 or more) to the horizontal when the nozzle is at the edge of the bed opposite a tower. Great Blog David. I am using your design, but I am considering using 400mm arms as I can get them premade. Any downside other than loss of build height? 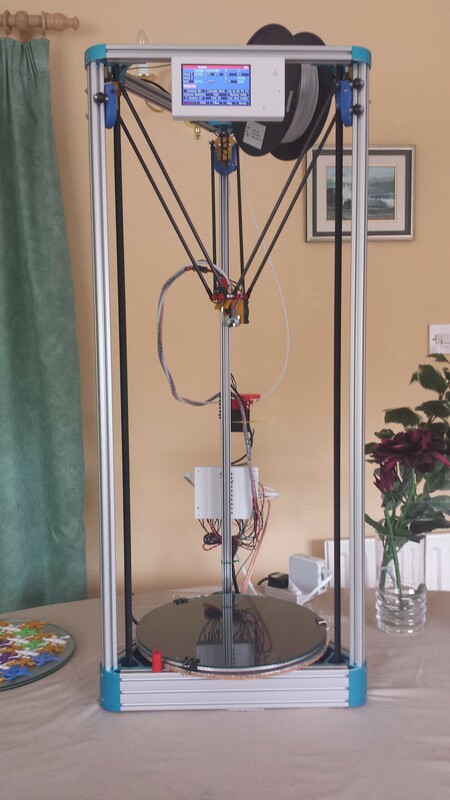 Have you seen my updated design at https://miscsolutions.wordpress.com/dc42s-large-kossel-build/ ? Yes, thank you. I am following your current BOM nearly to the letter. I am looking to stick with a 300mm build area, but could only source 600mm linear rail in a brand I liked. As I understood it, the 400mm arms would help me get full travel. I really need to sit down and take my lumps in understanding the math of the design phase.